Partly due to its unique underwater cliff faces and mostly due to its unique ecosystem of deep-water emergent black corals, diving into the Piopiotahi Marine Reserve is an experience unlike any other. Heavy freshwater rainfall merges into the shadowy, mountain-rimmed saltwater fiord to create the perfect scenario for these stunning corals to thrive outside their usual environment of only the deepest ocean trenches. Here, divers can research and swim among not only the corals – but also the more than 150 different species of fish, sharks, eels, octopus, stingray and more who call it home. Piopiotahi, more commonly known as Milford Sound, is one of ten marine reserves located in the Fiordland region of New Zealand’s South Island. 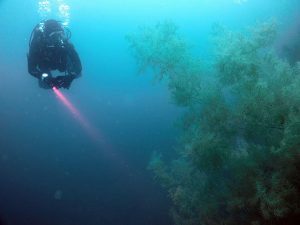 This week, Mandela takes us there to learn all about black coral – which is actually white – the history and geography of the reserve, and all things underwater with professional SCUBA diver Lance McKirdy from the cabin of his boat, West Bay. West Bay is one of two vessels that comprise the diving operation known as Descend Dive – the only operation running in the reserve.